My Headache Won’t Go Away! Did you know that your Headache may be from your neck muscles? It’s true. 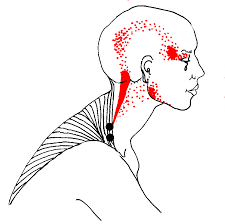 The muscles of the neck commonly refer pain to your head. 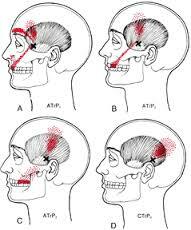 Trigger points, indicated by the black “x’s” on the pictures can refer pain to distant sources. Some of the symptoms can be mistaken for TMJ issues, Migraine, earache, sinus infections, toothache. Each muscle creates its own referred pain pattern. 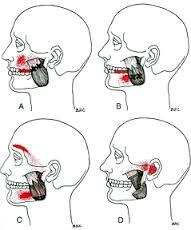 Below I have listed different symptoms that occur when a trigger point in these muscles refers pain to another area. Often, there is a triad of concomitant symptoms like dizziness, frontal headache, and dysmetria (lack of coordination of movement). headacheson the temples / “tension” headaches. facial, temple, or jaw pain. intolerance to weight on your shoulders. Treatment can be simple and quick or may take several appointments. 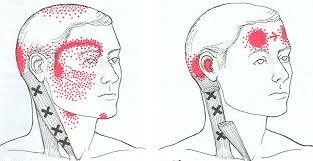 At Carolina TMJ and Facial Pain Center we often find that treating the trigger points through multiple modalities works the best. If you are suffering with the symptoms listed above and would like to learn more about your options of relief, call us now! This is more common than you may think. Many of my patients have complained about this. They present with severe ear pain and pressure, some eye pain or pressure, pain around the temple area, and sometimes sensitive upper teeth. How could this not be an infection of some sort….right? Well the truth is, you may be suffering from temporal tendonitis. Temporal Tendonitis is a craniofacial pain disorder affecting the temporal tendon. The temporal tendon is a tendon that connects your temporalis muscle (muscle on the side of your head and near your temple area) with your lower jaw on the coronoid process. temporal pain, TMJ pain, Eye pain, Ear Pain and Pressure, and sensitivity of upper maxillary teeth. Temporal Tendonitis is often caused by trauma (eating hard foods, dental work, etc..), loss of vertical dimension of occlusion (the distance between your nose and chin is shorter than it was when you were younger – you are becoming over-closed), chronic parafunction (your bite is off and your teeth do not come together appropriately), and/or hypertrophy of the coronoid process (your coronoid process, a part of your lower jaw, becomes larger than it once was). How Do You Treat Temporal Tendonitis? Treatment of temporal tendonitis can involve multiple processes, such as, anti-inflammatories (like ibuprofen), muscle relaxants, soft diet, splints/orthotics, physical therapy, biofeedback if clenching related, and/or injection therapy with a long lasting local anesthetic and a steroid, sarapin, or prolotherapy. If you believe that you may be suffering from Temporal Tendonitis, we can help you! Call us today for an evaluation and treatment and be DONE with that EAR PAIN once and for all! Did You Know That Your Tooth Pain Could Be From Muscle and Not Your Tooth? 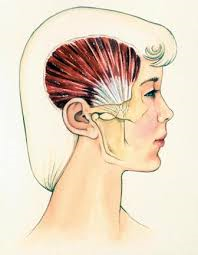 Call us today for your Head and Neck Muscle Evaluation to see if your “pain” is from your muscles. How can a Dental Appliance help my Migraines go Away? There are many types of teeth stains; some are caused by a person’s genetics, environmental or pharmacological in nature. The most common type is surface stains on the enamel or beneath the enamel. Surface stains are caused by foods, beverages and lifestyle behaviors, like smoking. Teeth whitening can help reverse some of the damage, however results vary by person. Can a Dentist Help You Sleep Better? Dr. Tracy Davidian is bringing revolutionary sleep treatments to the Triangle. Dr. Davidian uses state-of-the-art technology to treat snoring and sleep apnea. Why do I have Facial Pain? To understand the reasons for Facial Pain, you must first understand the different types of Muscular Disorders that can lead to Facial Pain.